A skills analysis form is a type of HR form or document which is used by business companies and organizations to identify the needed skill set of an individual who will be hired for a particular job. With the form, the company will be able to test out and document the results of their assessments. Moreover, skills analysis forms also help companies to be cost-efficient especially in lieu of hiring the right staff or employees to meet the demands of both the company and their clients. 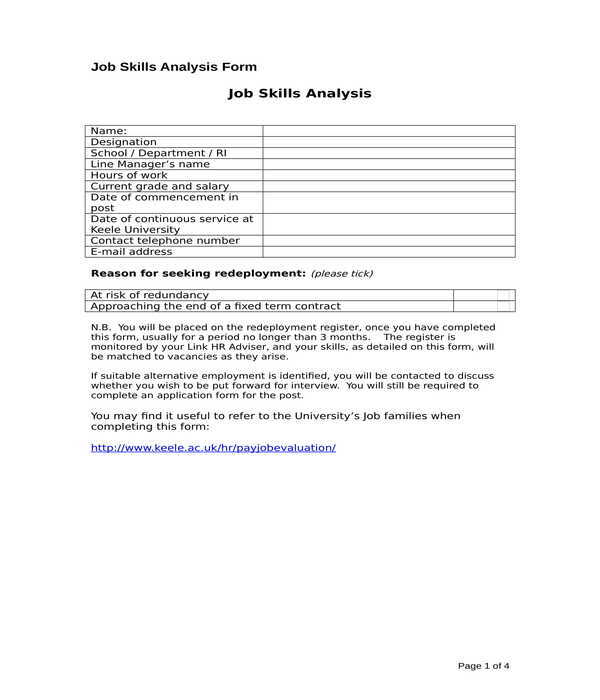 Job Skills Analysis Form – This is the most common form variety which is used by companies. Specifically, a job skills analysis form is comprised of five sections. 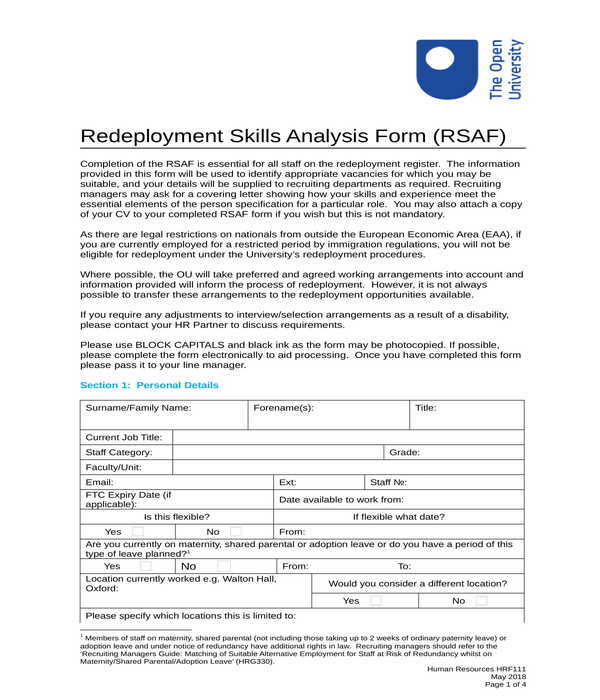 In the first section of the form, the user will be able to state his general information which will be used for identifying who the redeployment applicant is. Some of the data that the user or the applicant will be disclosing would be his name, the date of his job commencement, as well as the name of his line or department manager. In addition, the applicant’s contact information should also be included in the form. On the other hand, the second section of the form is for the reason of the applicant as to why he is seeking deployment while the third section documents the current job details of the applicant. In the fourth section, the applicant must enlist the key skills that he has along with the transferable skills that he can use for his next job assignment. Furthermore, the last section is allotted for the signature of the applicant and any supporting documents or proof about the applicant’s claims. 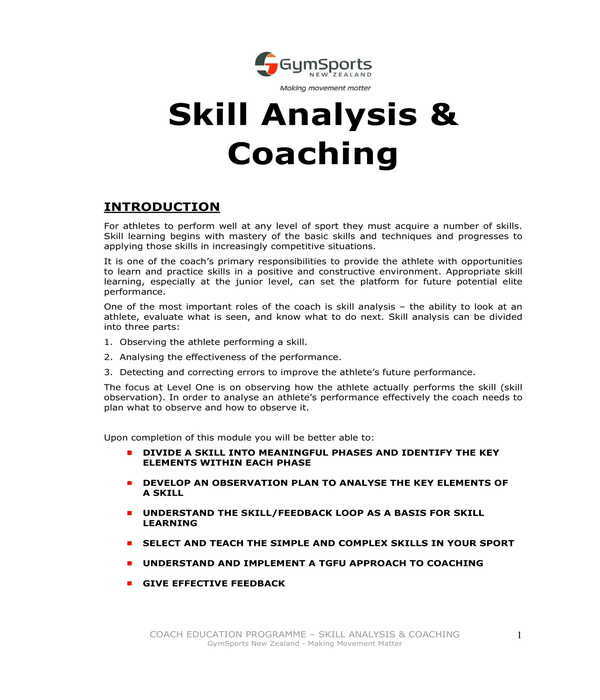 Skills Analysis and Coaching Form – Compared to the first form variety, this document is not to be filled out or be completed by a user rather it will be used as a guide to analyze the skills and provide lessons to coach and aid the user. With the form, the user will be able to know what skills he possesses as well as how he can strengthen his skills and understand how to use his skills effectively. Illustrations are also incorporated into the form which will be useful for showing and explaining the skills to the user. Additionally, the form is suitable to be used by sports and athletic coaches, specifically in teaching their athletes towards proper performance, body formation, and in identifying motor skills. Skills Gap Analysis – A skills gap analysis procedure is essential to be conducted by companies since this procedure helps in identifying what the company needs and what the prospective employees can offer in lieu of the job position to be filled in. 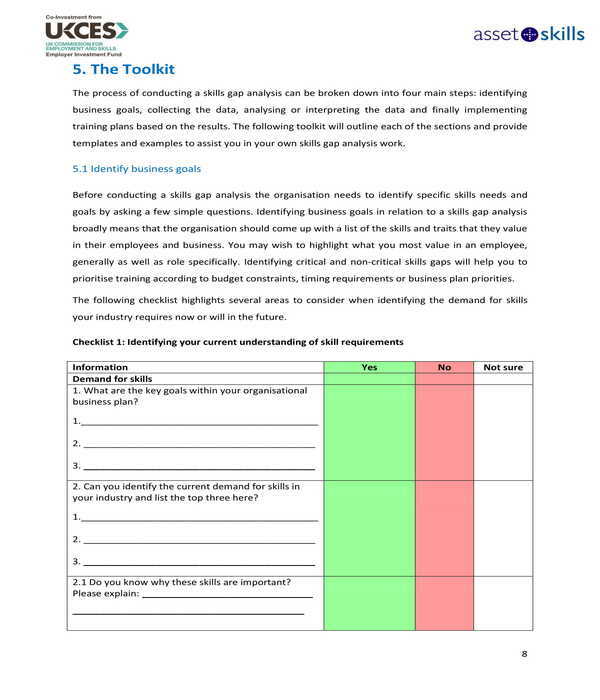 Aside from the basic contents of a skills analysis form, this document also provides further information about the skills gap analysis. An introduction statement welcomes the user of the form which is then followed by the presentation of the issues, solutions, and the considerations. The toolkit section of the form is where the analysis reports will be indicated wherein a set of questions are enlisted to be answered by the user. Other factors to be analyzed and be documented in the form includes the current processes and procedures that the company mandate as well as the job roles and competency requirements to be considered for the employee selection process. Step 1: Indicate the title and instructions on how the form can be completed. The title should be placed on the topmost center portion of the form while the instructions or the guide must be explained in the succeeding line or below the title. In addition, an area for specifying the document number can also be included on the top-right corner of the form for easier identification and documentation. Step 2: Incorporate a rating scale. Each number on the scale should have its own corresponding value. For instance, the number 5 will be for satisfactory or good performance while the number 1 is for poor performance or rating. How the final rating can be obtained by the user of the form should also be explained to allow the user in knowing the mathematical process that he must accomplish for achieving an overall analysis score. Step 3: Make a table. The number of columns in the table should be equal to the number of rating scale values, while the number of rows must be enough for the factors to be analyzed by the user. Some of the common skills analysis factors to be included in the table are the research and management techniques of the analysis subject along with its communication skills, and personal effectiveness. Step 4: Enlist questions. It is not enough to simply provide a rating for analyzing training skills and needs. This is the reason why questions must be added on the form to allow the user in fully explaining his justifications. Moreover, the answers will also allow the other members of the analysis team to understand and comprehend the views of the user. Step 5: Allocate an area for the plans and suggestions. This section should have enough space for the comments, decisions, and suggestions of the user. In addition, plans that the company can utilize should also be disclosed by the user to aid the company in conducting and effective skills training program. Step 6: Save the form. Once the layout and arrangements of the contents are finalized, the form must be saved into the desired format, either in “.PDF” or in “.DOC”. 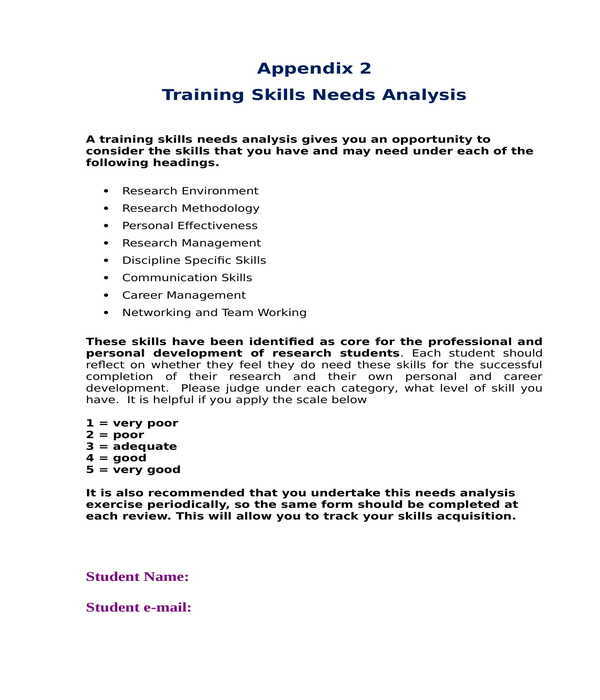 Why Use Our Skills Analysis Forms? Our skills analysis forms not only documents the results and outcome of an analysis process but also guides the users in knowing the importance of each variety to the company. This ensures that the form will be an effective instrument in the company and not a mere document which will add up to the piles of business paperwork and employment forms. Furthermore, our forms are also easy to use and edit, and can also be accessed using different devices due to its flexible formats.